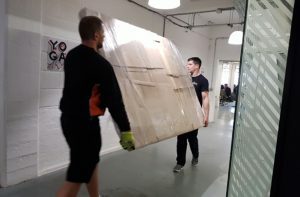 What happens with our meeting tables on delivery day? 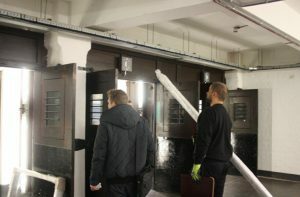 At Mac+Wood we love getting to see our expertly handmade furniture reach its final destination. 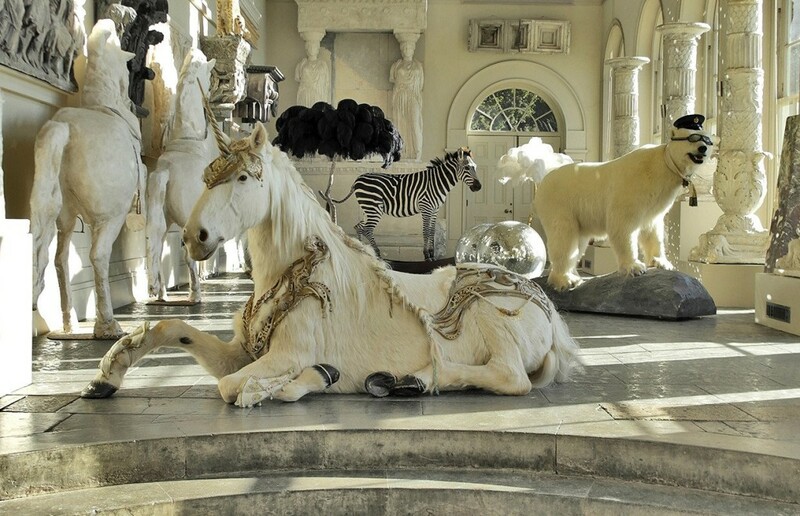 Seeing the unique furniture we create go from carefully crafted design plan, to a touchable centrepiece, is what inspires us to keep creating. Last week we were able to deliver two of our larger bespoke meeting tables to a couple of great companies. 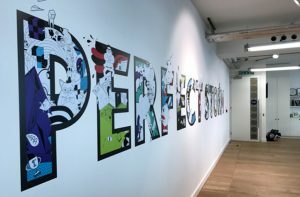 Our first delivery was to the stylish new offices of BBD Perfect Storm, a modern advertising agency with a keen eye for the contemporary. They commissioned us to produce a Dekton office table in the sumptuous Trillium finish. Dekton tables come in a huge array of carefully created colours and patterns. 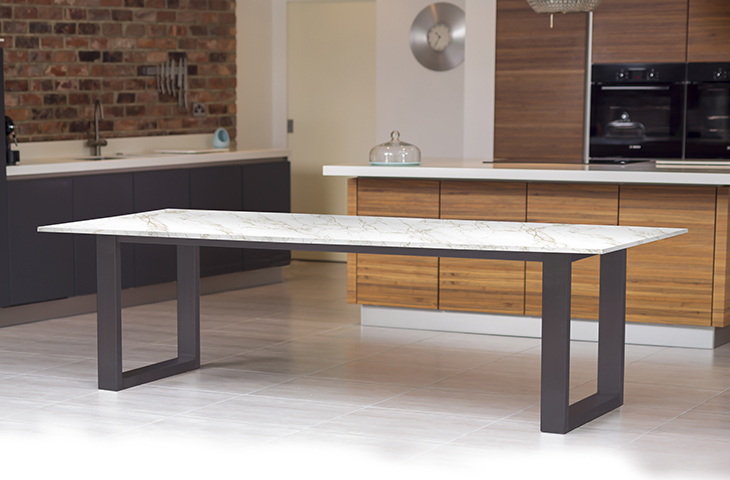 The Dekton surface is a really exiting addition to the contemporary furniture scene. Our job was to find the right finish for the space and to pair it with the perfect frame to create a striking contemporary boardroom table. With our help BBD paired their Trillium finish with our brand new “X” frame design, in brushed stainless steel, to complete the industrial-chic look. 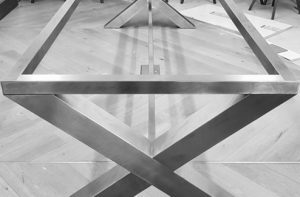 Having chosen their design, we handcrafted their centrepiece meeting room table and arrived outside their offices with only four flights of stairs between us the space. Our highly skilled team of installers assembled the sleek “X” frame in a matter of minutes, ready for the monolithic top to be installed. 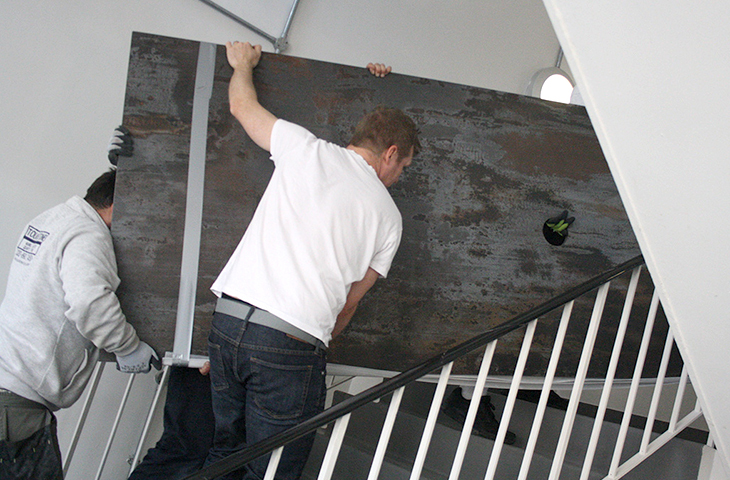 With our team of 6 getting a free gym class lifting the Dekton up the stairs, we successfully brought the table into the room where it will be used and admired. 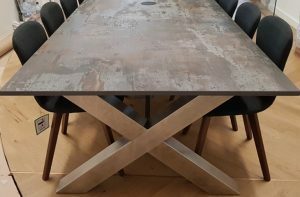 To complete this impressive new boardroom table for BBD we mounted the top to the frame and stood back to enjoy a successful installation and beautiful table. Paired with our Hudson chairs it is the perfect example of stylish modern office furniture. For our second delivery of the day we dashed down to Fetch, a mobile agency based in the characterful Tea building. 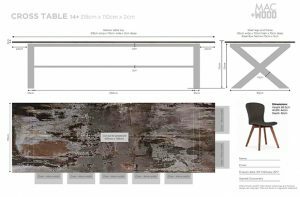 We had been commissioned to create a piece reclaimed wood furniture to be used as a boardroom/meeting room table for the team, complete with an AV unit so they could link up to the tech in the room, for meetings and creative sessions. Our beautiful reclaimed wood tables come from wood that is sourced from a huge variety of locations and carefully selected to produce a characterful focal point for any room. 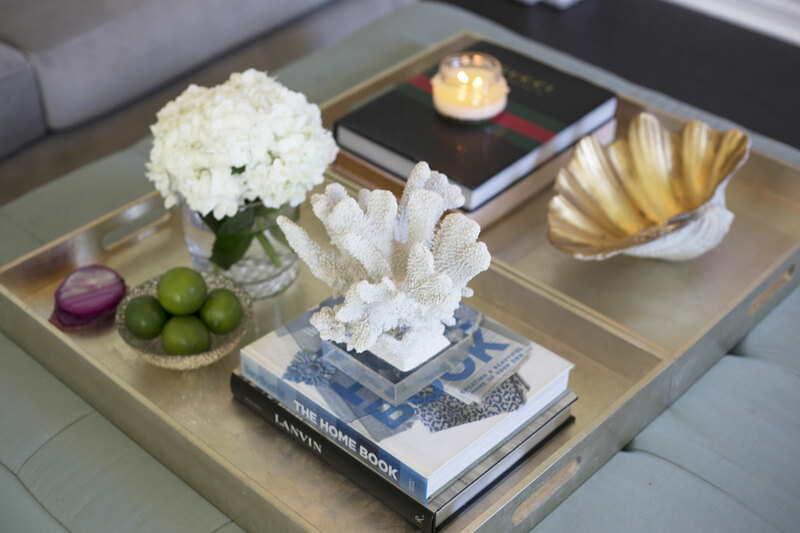 Paired with our Signature frame it produces a sleek contemporary look that brings warmth to any room. 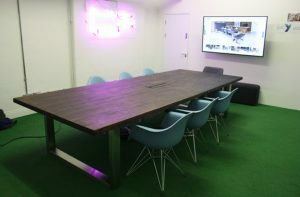 Our team installed this modern wood table in pride of place in the “Jammie Dodger” meeting room of Fetch. 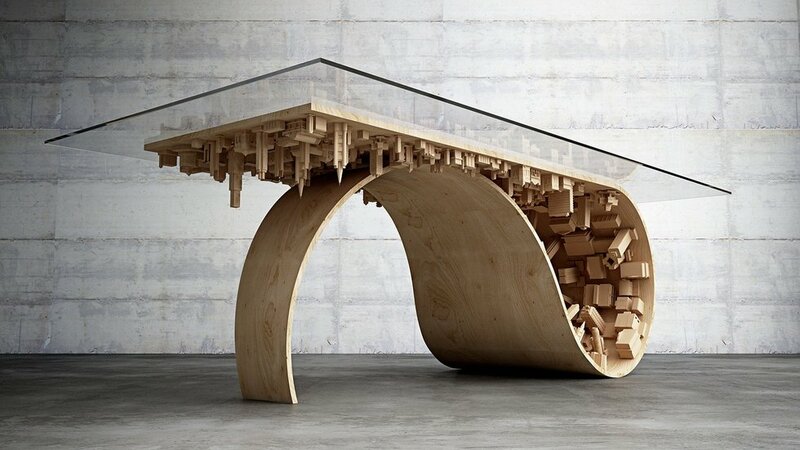 We hope that the style and substance of the table helps to inspire the ideas and innovations of those who use it in the future. At Mac+Wood we look forward to making your contemporary furniture design ideas a reality, in the office, as part of the your modern home furniture, or anywhere you need a centrepiece that creates a statement.